I watched a grown woman bring another woman to tears the other day—via YouTube. I’ve taken a real interest in watching YouTube videos as of late. There are a slew of girls filming makeup and beauty tutorials. The selection of black women doing this has actually been a refreshing sight to see. The portrayal is the widest spectrum of the black woman that I’ve been able to see as far as media goes. If you’re a natural woman looking for cute protective styles, there’s a video for that. Looking to find a 22 inch weave for your vacation? There’s a video for that as well. The thing that I loved about the black YouTube community is that they all seemed like they were doing an exemplary job of showing that every black woman you see is not a gum smacking, eye rolling black woman. The sophistication and refinement that these women display was enough to applaud. I was taken aback when I saw two black gurus that I admire being as petty as bickering back and forth on their Twitter pages. I’ll admit, it was a little humorous and thoroughly entertaining at first. It was easy to find where the problem stemmed from because these ladies film almost everyday. When I saw a 24 year-old woman crying in a parking lot because of her interaction from another woman I was repulsed. I almost felt sorry for them. Then I realized I needed to feel sorry for more then them. I needed to feel sorry for us. The competition among the black community is running rampant. And yes, a little competition never hurt anybody, but for it to be to the point where tears are shed, over YouTube? We’ve all been asked to choose between Biggie and Tupac, Jay-Z and Nas, even Foxy Brown and Lil’ Kim. Why couldn’t they all be great? There’s this weird misconception that there can only be one prominent black person in a field at a time. Has the “H.N.I.C” mentality transitioned from the plantation to a universal level? I could be wrong, but I don’t typically see coastal divides of musical selections in other communities. There was a whole era of music that split up black America, and rappers died because of it. 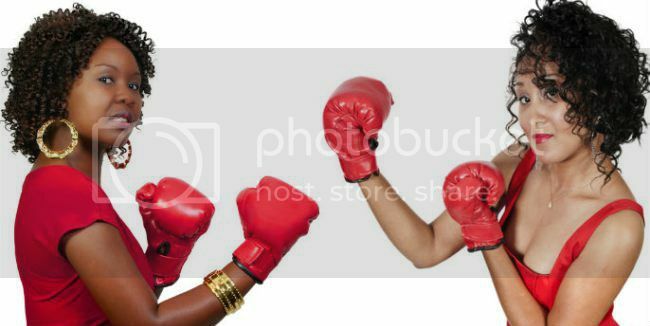 But aside from the combative nature brewing between the men of our community, the rivalries that are the most bothersome is the war between black women. The unspoken cattiness among women in general is already enough to make me cringe. But the cringe factor raises a few notches when it’s done within our race. There have been powerful black women pinned against each other for as long as I can remember. The panel of American Idol says enough. Before the season even aired there was much talk about Mariah Carey wanting to be the only woman judge. Bringing on Nicki Minaj, a more relevant artist, must have posed as a threat because the sly side remarks are more than apparent this season. We are the double minority—with America’s skewed paradigm of what we are supposed to be. A win from one of us could mean a win for all. There is room for more than one, so scoot over so we can all share a bit of the spotlight.